Finca Rio Perla was started 10+ years ago by Paul Siegel, who got his PhD doctorate in agricultural economics from Virginia Tech in the USA. His specialty area is agricultural and rural development in developing countries. At Finca Rio Perla we have horses, dairy cattle, chickens, tilapia fish ponds, several vegetable gardens and greenhouses, many different kinds of fruit trees, coffee, cocoa, banana, plantain, macadamia nut, and lots of nature related activities such as horseback riding, hiking, swimming, fishing, bird watching, checking out the farm, and just "being with nature". We have been planting coffee and cocoa trees at all elevations, and renovating our macadamia orchard. We are also planting fruit trees, trees for wood and shade... and for attracting birds. We grow sugarcane and have a 150 year-old sugar cane mill (trapiche) to make freshly squeezed sugar cane juice (you can mill your own sugar cane juice). Using cow manure, we have a worm composter to make new super-nutrient-rich soil (lumbricompost), and a biodigestor that generates gas that we use in the kitchen to pasteurize milk and for cooking. We also have some fermentation tanks where we brew natural foliar fertilizers. The biodigestor, worm composter, and natural foliar fertilizers are based on technologies adopted from nearby Earth University. 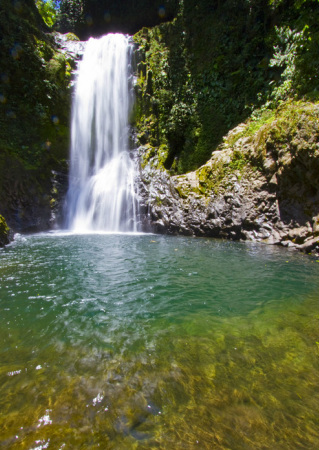 Our many amazing waterfalls and natural pools are breathtaking and fun. Go horseback riding (we have horses for riders of different sizes and experience), hiking to waterfalls, swim in the natural ponds, go tilapia fishing in our ponds, take a walk through the fields and forests, see the birds and flowers, or just sit back and relax. That's PURA VIDA! Our diet at Finca Rio Perla is mostly mostly based on healthy vegetarian cooking that includes dairy products from our cows, eggs from our chickens, and home-grown vegetables and fruits. We do have tilapia ponds, so fresh tilapia fish is available. We combine traditional Costa Rican cooking with international vegetarian recipes with food from the farm. Volunteer/Intern is an option if you are interested in working on our farm. The Finca Rio Perla Farm Experience is focused on horse care and maintenance in the morning hours and gardening in the mid-afternoon. If you have special farm-related skills please let us know. 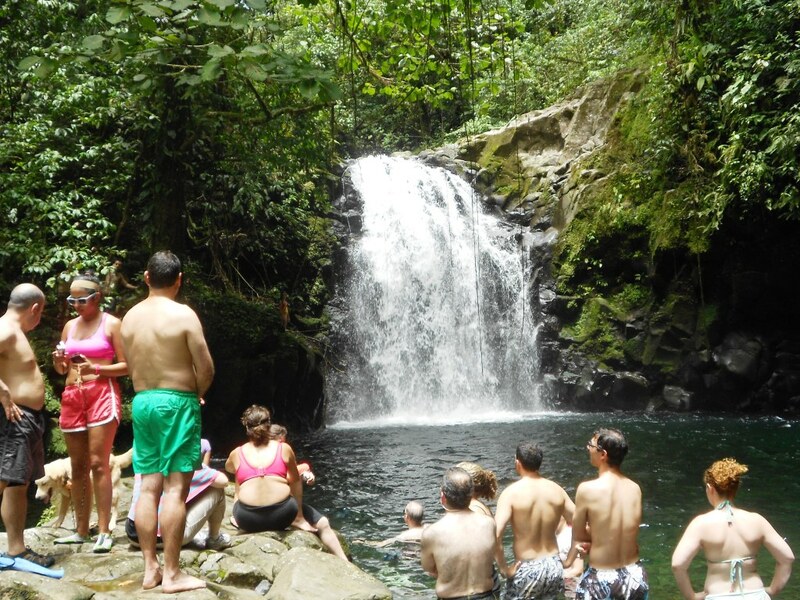 The Finca Rio Perla Volunteer/Intern Program provides a true Costa Rican farming experience in a beautiful natural setting.This is also a great opportunity to learn Spanish through immersion however, this is not a teaching or training program. Ask us about volunteering and/or interning at Finca Rio Perla.